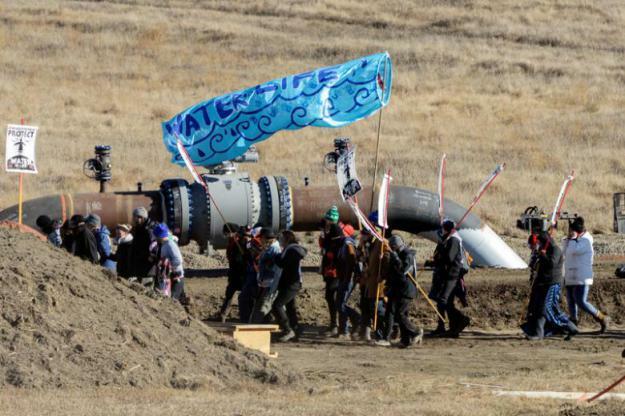 The Standing Rock Sioux tribe, which is leading a four-tribe lawsuit against the four-state pipeline built by Texas-based Energy Transfer Partners, in court documents filed Thursday asked a federal judge to reject the findings. “The corps has conducted a sham process to arrive at a sham conclusion, for the second time,” tribal Chairman Mike Faith said in a statement. The pipeline has the capacity to move half of the oil produced daily in North Dakota, the nation’s second-leading producer behind Texas. It passes just north of the Standing Rock Reservation, beneath a Missouri River reservoir that is the tribe’s water source. The pipeline has been moving North Dakota oil through South Dakota and Iowa to a shipping point in Illinois since June 2017. That same month, U.S. District Judge James Boasberg ruled that the Corps largely complied with environmental law when permitting the pipeline but needed to do more study of its impact to tribal rights. The Corps filed its work with the court in late August. Standing Rock’s challenge says the Corps “failed to grapple with extensive technical input provided by the tribe and others undermining its conclusions.” The major example the tribe offered is information it says shows the Corps has underestimated the risk and impact of an oil spill. The tribe continues to maintain that the only lawful way to resolve the matter would be through a full environmental study that includes consideration of route alternatives. The Corps had planned to do a more extensive environmental study before President Donald Trump took office in January 2017 and pushed through completion of the stalled project. The agency said in court documents in August that the additional study concluded a more thorough review is unwarranted. The tribe asks Boasberg to reject that conclusion. BISMARCK, N.D. — The lone remaining environmental group facing racketeering accusations by the developer of the Dakota Access oil pipeline has asked a federal judge to be dismissed from the case. ETP initially sued Greenpeace, Earth First and BankTrack last year for up to $1 billion, alleging they worked to undermine the $3.8 billion pipeline that’s now shipping North Dakota oil to a distribution point in Illinois. The lawsuit alleged the groups interfered with company business, facilitated crimes and acts of terrorism, incited violence, targeted financial institutions that backed the project, and violated defamation and racketeering laws. The groups maintained the lawsuit was an attack on free speech. U.S. District Judge Billy Roy Wilson this summer dismissed both BankTrack and Earth First as defendants. In July, he denied a motion by Greenpeace to be dismissed, as well, but he also ordered ETP to revise the lawsuit that he said contained vague claims. Company lawyers did so last month. Greenpeace attorneys maintain that “ETP has utterly failed to follow the court’s direction,” and that the amended lawsuit “contains much the same inflammatory, insubstantial language” as before. ETP spokeswoman Vicki Granado declined comment, citing company policy against commenting on active litigation. Company lawyers on Tuesday asked Wilson to reconsider his late August order that the company identify 20 unnamed individual defendants in its lawsuit within a month or have them dismissed as defendants. ETP wants the opportunity to gather more evidence to properly identify the people that it alleges played a role in inciting a massive protest against the pipeline while it was being built. 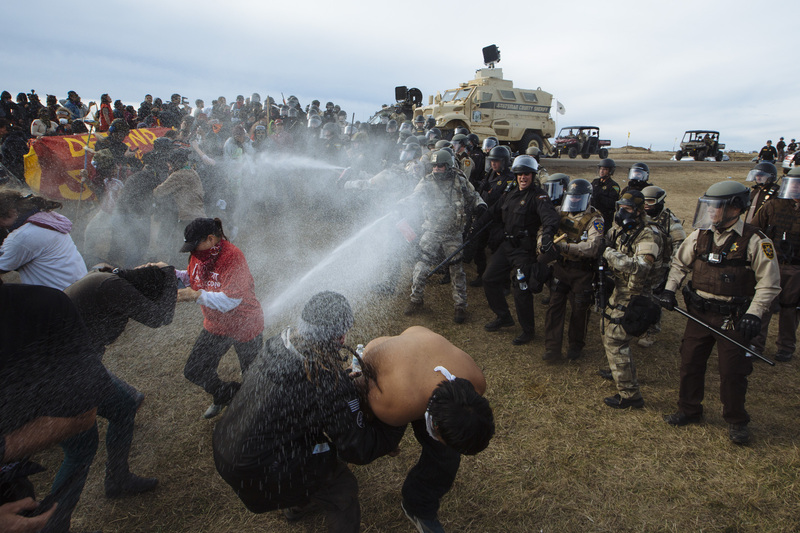 Protests by groups and American Indian tribes who feared environmental harm resulted in 761 arrests in southern North Dakota over a six-month span beginning in late 2016. ETP also is suing five named individual defendants: two Iowa women who have publicly claimed to have vandalized the pipeline; two people associated with the Red Warrior Camp, a protest group alleged to have advocated aggressive tactics such as arson; and Virginia resident Charles Brown, who the company alleges is “a pipeline campaigner for Greenpeace” and specializes in interfering with ETP projects including the Bayou Bridge Pipeline in Louisiana. 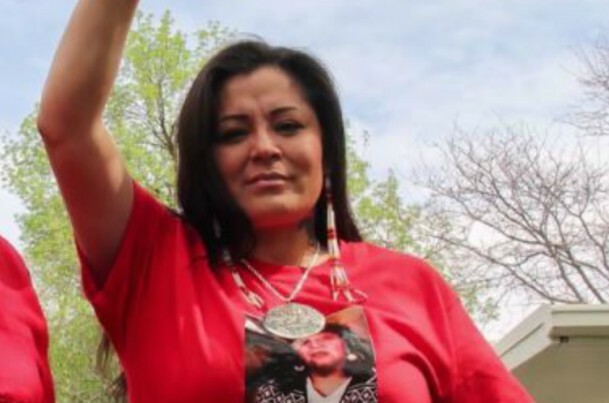 Red Fawn Fallis has been sentenced for her role in a shooting incident during the Dakota Access pipeline protests. According to media reports, Fallis, 39, was sentenced Wednesday to four years and nine months in federal prison. Fallis, a member of the Oglala Sioux tribe, was accused of firing a handgun three times while resisting arrest on Oct. 27, 2016. No one was hurt. She pleaded guilty Jan. 22 to civil disorder and illegal possession of a gun by a convicted felon. Prosecutors agreed to drop another weapons charge. Prosecutors were recommending seven years in prison, though U.S. District Judge Daniel Hovland could have gone as high as 15 years. Fallis did not get credit for time served in a halfway house after she was arrested in January for violating her pretrial release agreement. Judge Hovland says he is recommending placement in Phoenix or Tucson, Ariz.
Fallis is also sentenced to three years of supervised probation after her release; including special conditions of drug and alcohol treatment and treatment for mental health issues. The sentence can be appealed within 14 days of the judgement being signed. Fallis’s arrest was one of 761 that authorities made during the height of the Dakota Access pipeline protests near Standing Rock, North Dakota in 2016 and 2017. Red Fawn Fallis stands outside the Federal Courthouse in Bismarck, N.D.
Red Fawn Fallis was arrested by US Marshals in Fargo Thursday for violating conditions of her pretrial release. Fallis was charged for allegedly firing a handgun three times during her arrest at a Dakota Access Pipeline protest in October 2016. No one was injured. U.S. District Judge Daniel Hovland agreed in June to allow Fallis to move from jail to a halfway house over the objections of prosecutors. She was moved in October. The High Plains Fugitive Task Force said a federal warrant was issued before Fallis was arrested without incident at a halfway house in Fargo around 5 p.m on Jan 18. She was supposed to attend GED courses at the Adult Learning Center in Fargo Thursday morning, but never showed up, according to a petition filed by Fallis’ pretrial Services officer. She was also allegedly half an hour late returning to the halfway house. Fallis was arrested after she returned and taken to the Cass County Jail, where she’ll remain in custody of the U.S. Marshals Service until further order by the court. It was reported Wednesday that Fallis reached a plea deal for her DAPL related charges. She is scheduled to appear in Bismarck’s federal court Monday to plead guilty to civil disorder and gun possession to avoid trial. Attorneys for Fallis said the decision was based on anti-protester sentiment in the area and unsuccessful attempts to have a judge order the prosecution to turn over more information, including details about an FBI informant Fallis alleges seduced her and owned the gun. Her arrest Thursday won’t affect the hearing, but it could result in her being sent back to jail as the case proceeds. Fallis was among 761 pipeline opponents arrested by authorities between August 2016 and February 2017 during protests led by the Standing Rock Sioux tribe in North Dakota. A proposal by North Dakota judges who say out-of-state lawyers are no longer needed to represent Dakota Access pipeline protesters has drawn hundreds of complaints. Judges from the state’s South Central District, who have been handling the protest cases, say the legal provisions are no longer justified because no new cases have been filed, the Bismarck Tribune reported. A majority of the more than 500 comments to state court officials are against the move, with many saying there’s still too much unfinished business for appointed attorneys to handle. The waiver has allowed out-of-state attorneys to represent clients as long as they sponsored by a North Dakota lawyer. 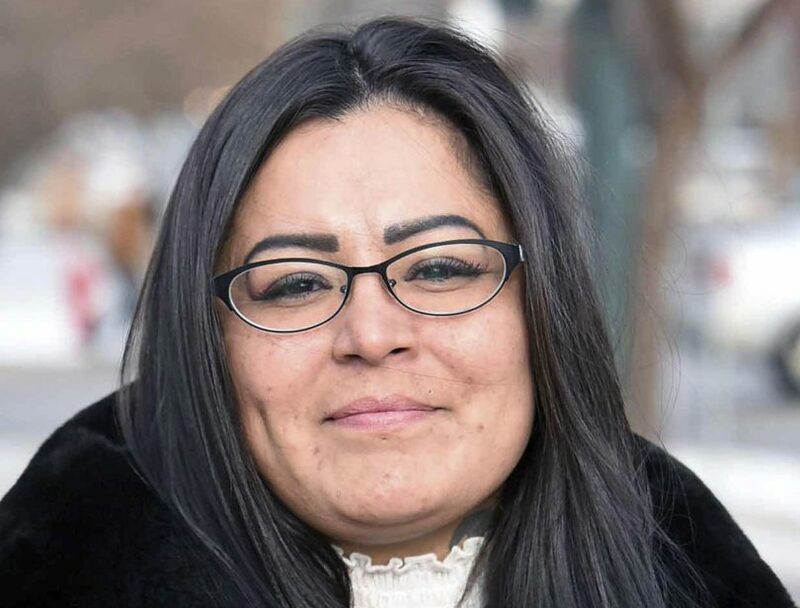 “To discontinue the special provisions at this juncture would do a great disservice to justice as it would undoubtedly result in disruption of legal representation in active cases and higher rates of unrepresented individuals,” Spirit Lake Tribal Chairwoman Myra Pearson wrote in her objection. 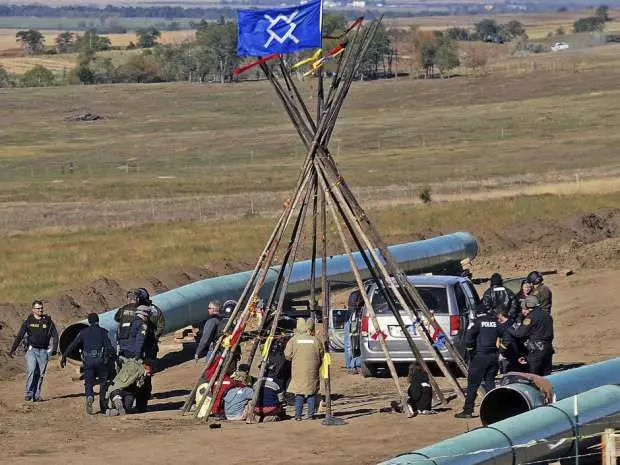 One comment supporting the judges’ proposal came from North Dakota Commission on Legal Counsel for Indigents, which handled 435 pipeline protest cases. The comment period on the proposal ended Monday. Supreme Court Clerk Penny Miller says she expects the court to take up the matter within the next couple of weeks. About 830 criminal cases were filed in connection to the DAPL protests. More than 400 have closed, most of them with dismissed charges. A Secwepemc activist from B.C. is in a North Dakota court today to face charges stemming from her involvement with protests in Standing Rock. Kanahus Manuel was among dozens of people arrested near the construction of the North Dakota Access Pipeline last Oct. 22. She faces charges of criminal trespass, engaging in a riot, obstruction of a governmental function, disobedience of a public safety order during riot conditions and disorderly conduct. “They’re bogus charges. It wasn’t a riot,” Manuel told CBC via telephone after travelling to Mandan, ND from B.C. The sun was rising as the police began to make arrests, she said. “It was really violent,” she said. “We had elders, women and pregnant women. It was a peaceful march, we were singing. Manuel spent the day and night in jail and was released the next day. Two weeks later, she plead not guilty to the charges against her. This isn’t the first time Manuel has faced criminal charges related to defending Indigenous rights. In 2002 she was sentenced to three months in the Burnaby Women’s Institute for protesting the construction of the Sun Peaks Resort in her home territory, citing threats to traditional hunting grounds. Manuel has also protested on the front lines against well-known development projects in B.C. like the Kinder Morgan pipeline expansion and the Mount Polley tailings spill disaster by Imperial Metals. Manuel said she’s headed to the courthouse with a fearless attitude, carrying the prayers of her supporters and holding onto her faith in traditional ceremonies to help get her through. 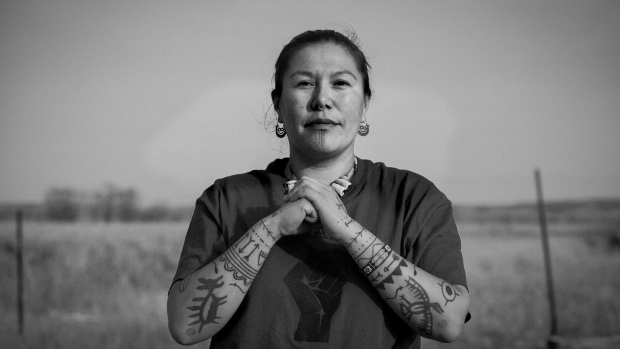 She stressed she’s not alone, and hundreds more are going through similar struggles since the events at Standing Rock. 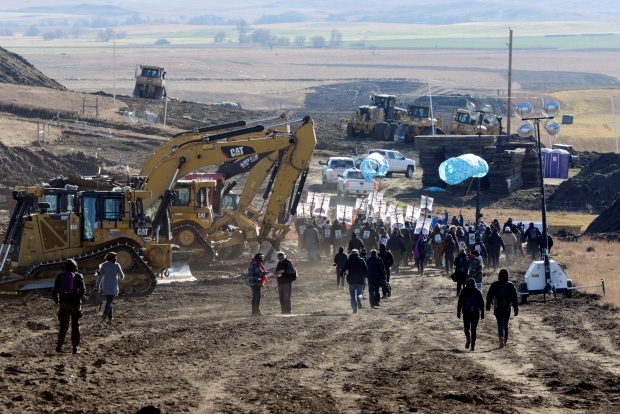 North Dakota’s bill for policing protests of the Dakota Access pipeline continues to rise. The North Dakota Emergency Commission is set to borrow an additional $5 million Monday to cover law enforcement costs. That will bring the total line of credit from the state-owned bank of North Dakota to $39 million. State Emergency Services spokeswoman Cecily Fong says 11 states provided law enforcement help to North Dakota, and some bills are only now arriving. The $3.8 billion pipeline built by Texas-based Energy Transfer Partners began moving oil from North Dakota to a distribution point in Illinois in June, after months of protests. The Emergency Commission also is set to approve a $10 million federal grant to help pay state law enforcement bills related to the protests. 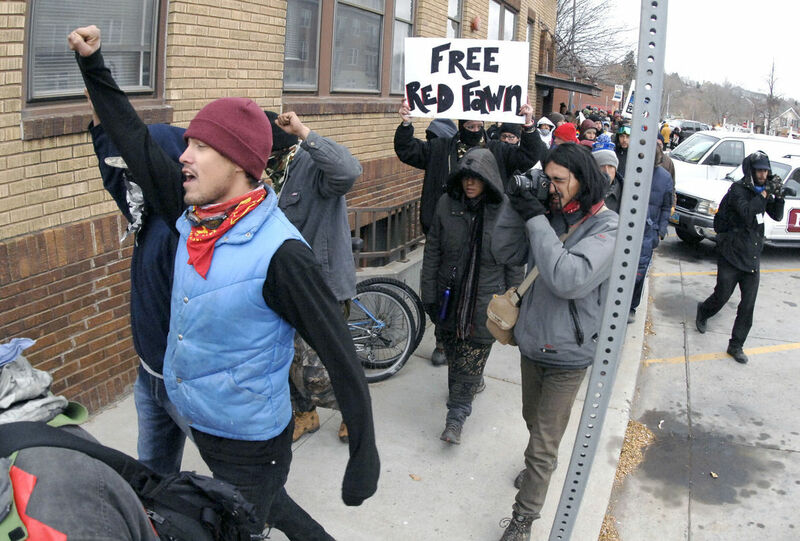 Friday morning federal agents raided a Des Moines Catholic Worker House where two women who’ve claimed responsibility for vandalizing the Dakota Access Pipeline were staying. Last month, during a press conference outside the Iowa Utilities Board headquarters, Catholic workers and activists, Jessica Reznicek, 36 and Ruby Montoya, 27, revealed they secretly carried out multiple acts of sabotage including burning millions of dollars in construction equipment at pipeline locations across Iowa and other states. The two were then arrested for damaging a sign outside the Iowa Utilities Board building. 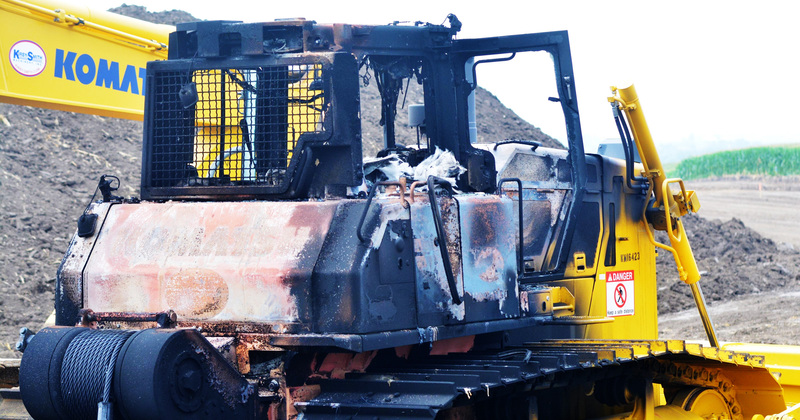 “Using tires and gasoline-soaked rags we burned multiple valve sites, their electrical units, as well as heavy equipment located on DAPL easements throughout Iowa,” said Montoya. 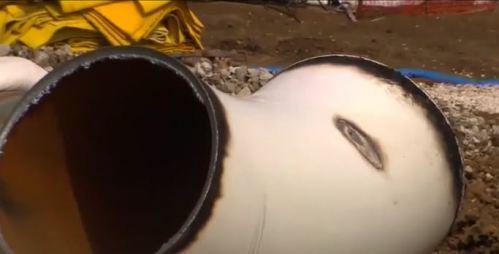 A burned hole was discovered at a valve site in Iowa. The Des Moines Register reports, about 30 law enforcement personnel, led by agents armed with guns who identified themselves as being from the Federal Bureau of Investigation, entered the catholic workers house just north of downtown Des Moines shortly after 6 a.m. The agents left about 10:30 a.m. with boxes and sealed bags of property they had seized. There were no arrests or injuries during the raid. Reznicek and Montoya were at the house on Friday. 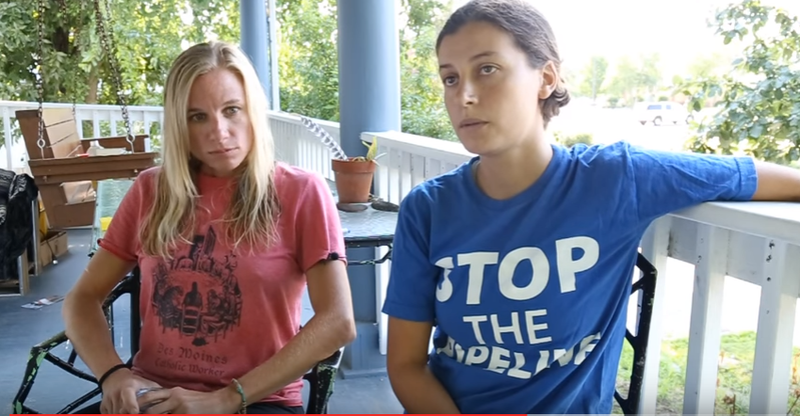 According to KIWARadio.com, Alex Cohen, part of the “Mississippi Stand” group that sought to halt the pipeline’s extension from southeast Iowa across the river into Illinois, said the women told him that they were kept on the front porch of the house as the agents conducted the search inside. Cohen says the women consider some of the materials seized during the raids to be protected by the attorney-client privilege and, now that it’s in the hands of federal authorities, it will hurt the chances at a fair trial. Both women, who remain free on bond, say they were fighting a “private corporation” and “never threatened human life nor personal property” with their actions. In the past, Reznicek has been arrested multiple times in various protests. Montoya was most recently charged in a protest over a pipeline in Tennessee. 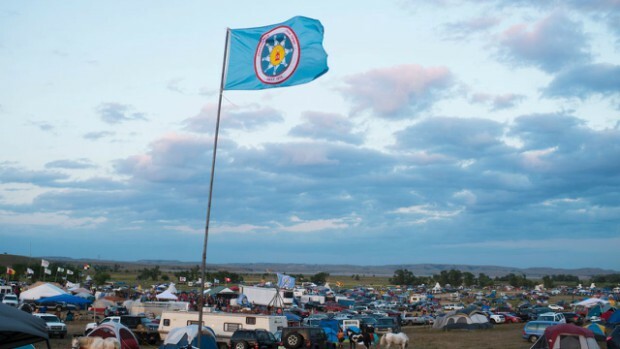 In 2014, the Standing Rock Sioux Tribe began opposing the construction of the Dakota Access Pipeline developed by Dallas-based Energy Transfer Partners. Months of demonstrations by thousands of opponents sought to halt construction of the four-state pipeline from North Dakota, through South Dakota and Iowa to Illinois. A federal judge has given Red Fawn Fallis permission to move from a jail in Rugby to a halfway house. U.S. District Judge Daniel Hovland ordered on Tuesday that Fallis be released as soon as space is available at Centre Inc. in Fargo. Hovland had previously denied a similar request for Fallis, who is accused of shooting at police officers during a Dakota Access Pipeline protest on Oct. 27. In his order, Hovland cited Fallis’ successful completion of a furlough to attend a memorial service in Colorado for her mother and the need for easier communication with her attorney, Bruce Ellison, of Rapid City, S.D. U.S. Attorney David Hagler had opposed the request, saying she remained a danger to the community and a flight risk. Fallis’ trial, which was scheduled for July 17, has been postponed to Dec. 5. Ellison asked for the continuance due to the amount of evidence and legal issues in the case. The government did not oppose this request. The government and judge have not yet responded to his request. A federal judge on Wednesday said the U.S. Army Corps of Engineers did not fully weigh the impacts of the Dakota Access pipeline and ordered it to reconsider sections of its environmental analysis. U.S. District Judge James Boasberg in Washington said that while the Army Corps substantially complied with the National Environmental Policy Act, it did not adequately consider the impacts of a possible oil spill on the fishing and hunting rights of the Standing Rock Sioux tribe. The tribe had sued the Army Corps over its approval of the controversial Dakota Access Pipeline in North Dakota. “To remedy those violations, the Corps will have to reconsider those sections of its environmental analysis upon remand by the Court,” the judge said in a court order. Operations of Energy Transfer Partners LP’s pipeline have not been suspended but will be considered later, the order said.